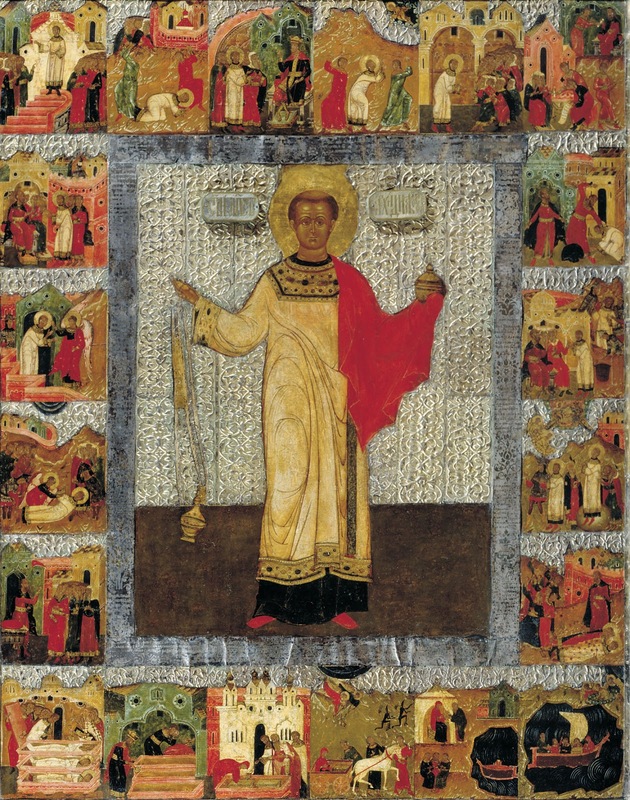 On the twenty-seventh of this month [December], we commemorate the Holy Apostle, Protomartyr and Archdeacon Stephen. Stephen is crowned, with his crown of stones. The blessed Protomartyr and Archdeacon Stephen, when there was a discussion taking place between Jews and Sadducees and Pharisees and Greeks regarding our Lord Jesus Christ, and some said He was a prophet, while others said He was a deceiver, and yet others said He was the Son of God; as this discussion was taking place, the renowned Stephen stood up at a high place, and he proclaimed our Lord Jesus Christ to everyone, saying: "Men and brethren, why has your wickedness increased, and all of Jerusalem is troubled? Blessed is the man who has not received into his heart hesitation towards Jesus Christ. For He is the One who bent the heavens, and came down for our sins, and was born of the Holy Virgin who was pure and chosen from before the foundation of the world. He received our infirmities, and took on our sicknesses. He made the blind see, cleansed lepers, and removed demons from the demon possessed." When the Jews heard this, they brought him to the tribunal before the high priests. Being unable to withstand his wisdom and his power of the Holy Spirit by which the divine Stephen spoke, they presented false witnesses against the Apostle, who testified saying: "We heard him speak blasphemy against Jerusalem, and against the divine law." He went on to say everything else that is recorded in the sacred Acts of the Apostles in the seventh chapter. Then all those who sat in judgement turned their eyes towards Stephen, and they beheld his face to be so radiant, that his face resembled that of an Angel. Unable to endure the shame, they had him stoned, and he prayed for them saying: "Lord do not weigh this sin against them." Saying this, he reposed. Since the Protomartyr by his customary fall toppled his opponent the devil, and his corpse was seen to be magnificent and extraordinary, having reposed in the sweet sleep of martyrdom, his sacred body was taken by pious men, and put in a coffin made of persea wood. Having sealed it, they placed it beside the Temple. Then the teacher of the law Gamaliel and his son Abelbus believed in Christ and were baptized by the Apostles. 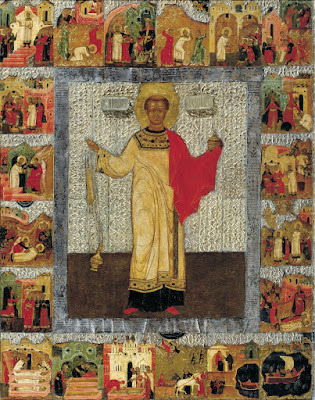 The Synaxis of Saint Stephen is celebrated in his martyric Temple, which is situated near the place called Konstantiana. 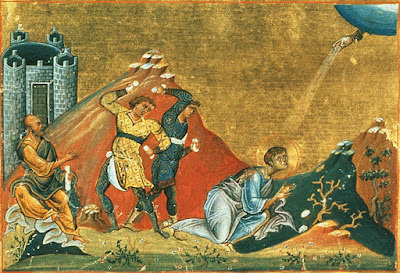 It should be noted that Saint Stephen was stoned three years after the Ascension of Christ, according to the most precise chronologies. Thou art crowned with a royal diadem, for contests endured in Christ's name, O first and holy Martyr; thou didst put to shame thy persecutors, and see thy Saviour at the right hand of the Father. Ever pray to Him for our souls. Yesterday the Master came to us in the flesh, today His servant departs in the flesh; yesterday the King was born in the flesh; today His servant is stoned to death for His sake. Hence the divine and first Martyr Stephen is made perfect.